Carrot cake has always been a family favorite. For years I made the carrot cake recipe published in The New Basics Cookbook, by Julee Rosso and Sheila Lukins. The recipe was developed by Sheila's mother Berta. 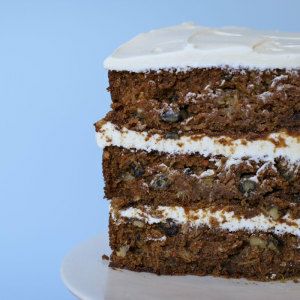 The recipe headnotes encourage you to eat this carrot cake unfrosted for breakfast. I confess I may have eaten a piece for breakfast once or twice...with frosting. This does not mean I recommend this practice. 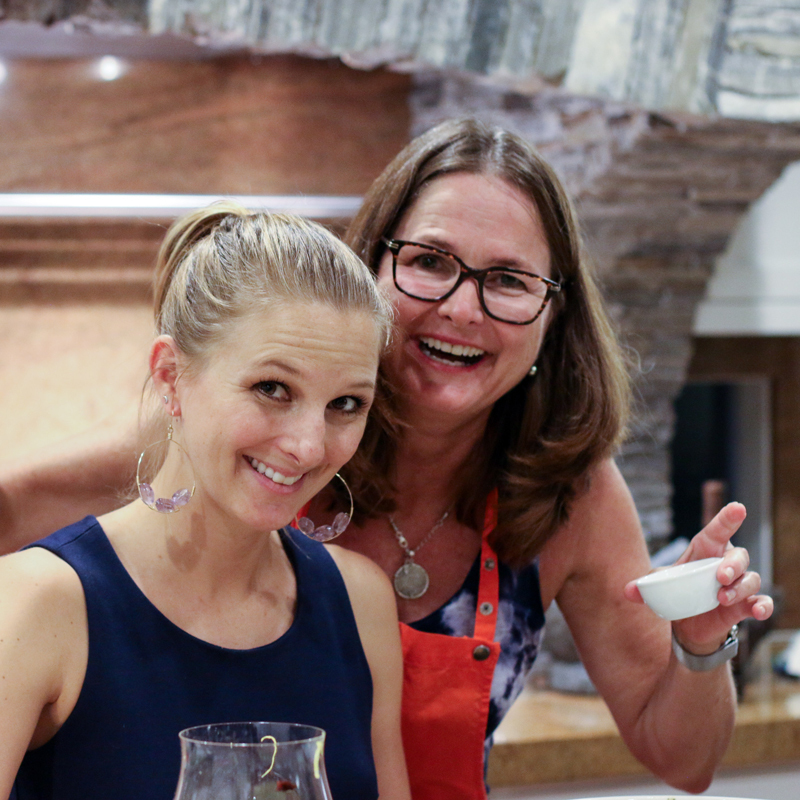 For this recipe, I start with Berta's recipe, and amp it up for an adult palate. I use fresh pineapple instead of canned, olive oil instead of corn oil, add a hefty shot of bourbon and boost the spices. My goal was to achieve a super moist, spicy, not-too-sweet cake. I use Nielsen Massey Madagascar Bourbon Pure Vanilla Paste because it is so darn good. I am not sure there is anything more addicting than cream cheese frosting. Buttery, sweet and tangy, it is a must for any carrot cake. This recipe is for a three-layer cake and is big enough to feed 16 - 20 people. Yep, it is a whopper. Alternatively, you can cut the recipe in half and bake it in a 13 x 9 x 2" cake pan. The baking time is about the same. Just test with a tooth pick to check doneness. My niece Madi is attending culinary school and has a wealth of baking knowledge. She taught me to freeze your cake before you frost it. This keeps the cake from crumbling into the frosting. If you have the time freeze over night and then put the cake in the fridge the night before you frost it. Or if you are short on time even an hour in the freezer is helpful. The beauty of this cake is it can be made several days in advance. You can freeze the cake for a few days before you frost it. Because it is incredibly moist it keeps for several days in the fridge even after it is frosted. This grownup bourbon-ized carrot cake with olive oil, fresh pineapple and walnuts is moist and spicy. Topped with classic, buttery cream cheese frosting, this is a carrot cake lover's dream. Arrange oven racks in the middle of the oven so they can accommodate three 9" cake pans. Heat oven to 350 degrees. Put carrots in a pot and cover with water. Bring to a boil, reduce heat and cook until fork-tender, about 12 - 15 minutes. Drain the carrots and allow to cool. When cool, puree in a food processor or blender. Set aside. While carrots are cooking, line three 9" cake pans with parchment paper. Butter or lightly oil both sides of the parchment so that the parchment adheres to the cake pans. In a large bowl, sift the flour, sugar, baking soda, cinnamon, ginger and cloves together. Add the vanilla, bourbon, eggs and olive oil and mix to combine with an electric mixer. Add the carrots, fresh pineapple, walnuts and coconut and stir by hand to combine. Pour the mixture evenly into three cake pans. Bake the cake layers for about 1 hour. Cakes are done when a toothpick inserted in the middle of the cake comes out clean. Remove from the oven and set on cooling racks. In a mixing bowl, cream the butter and cream cheese together with an electric mixer. Sift the powdered sugar into the bowl, add the lemon and vanilla and continue mixing until frosting is smooth. When ready to frost, remove the parchment paper from each layer. Frost between layers and on top of the cake. This frosting is very rich, so I prefer not to frost the sides of the cake. 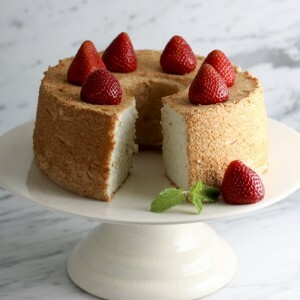 Best chilled before serving, this cake will keep in the fridge for several days. This recipe can be cut in half to make a 13 x 9 x 2" cake. Baking time is about the same. Test with a toothpick for doneness. Yo forgot yo walnuts, yo! That I did! Thank you for catching it. Two cups of walnuts are now in the recipe. Thank you Tiny Cookbook! 2 cups of olive oil can you tell me what kind you use ? I use a good quality, mild flavor extra virgin olive oil. Personally, I use Stonehouse California olive oil that I buy by the 10 liter box as I go through a lot of olive oil. There are a lot of not great olive oils that do not have the full nutritional value of olive oil or are actually blends of lesser quality olive oils. Never use lite olive oil as is is nutritionally inferior.